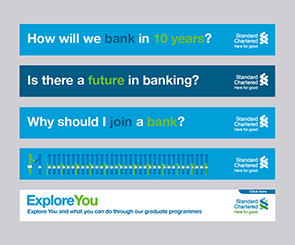 Graduates application numbers increased by +50%, which are 30,000+ more than the year before. 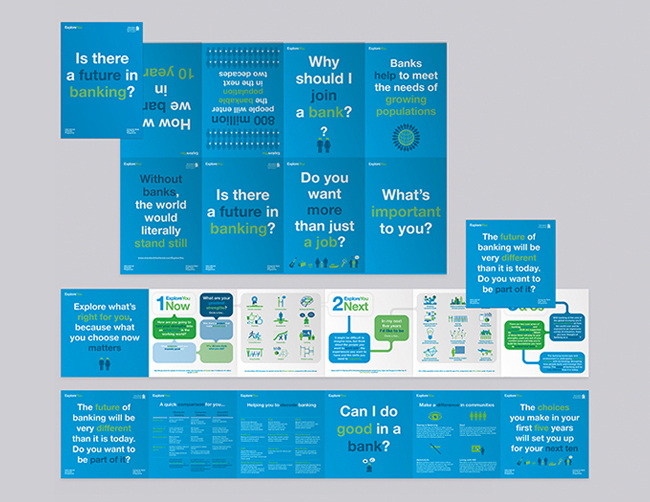 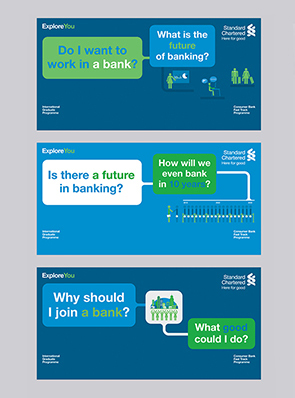 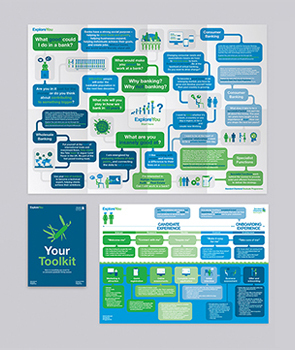 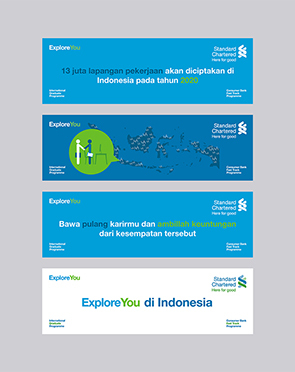 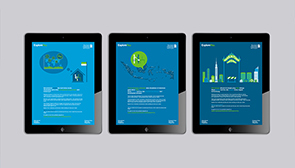 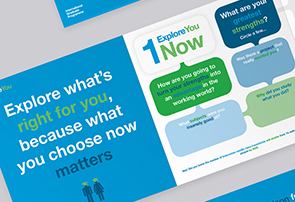 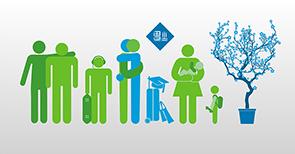 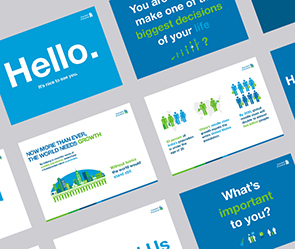 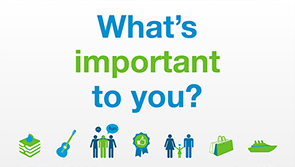 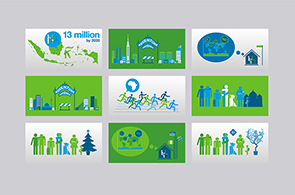 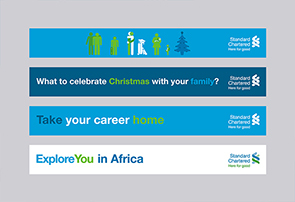 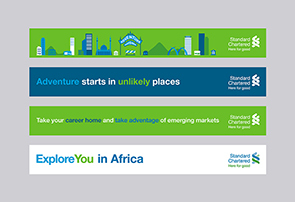 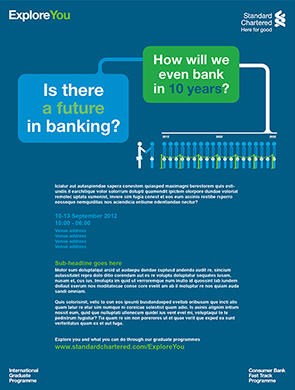 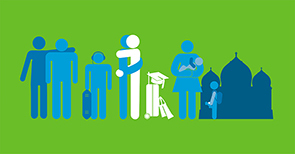 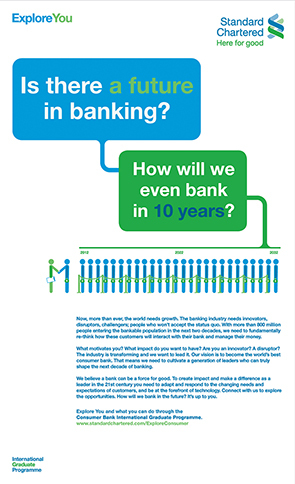 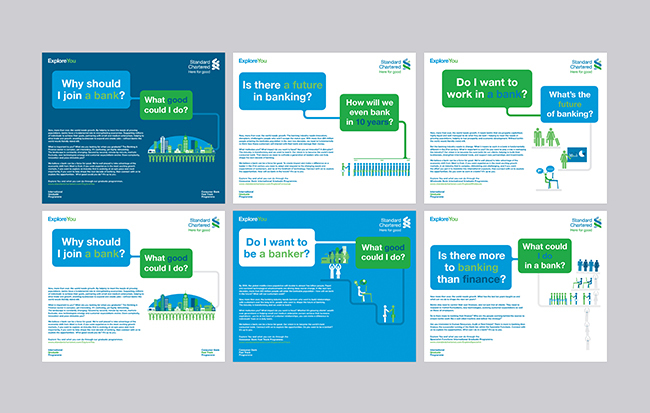 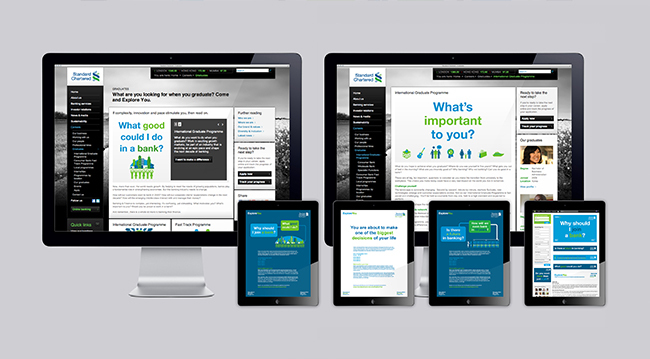 Standard Chartered is using this set of key visual 4 years in a roll (2012-2016). 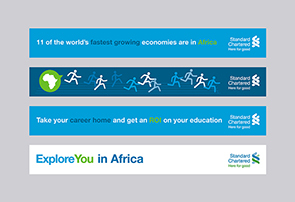 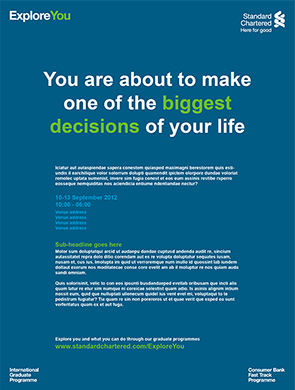 Back in 2012 Standard Chartered was failed to attract universities graduates to apply to their bank. 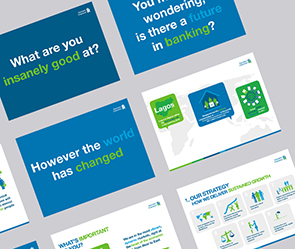 They claim themselves as the best office environment to work in among the banking industry that aligned with their brand belief "Here For Good". 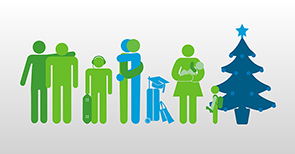 They needed to increase the graduate recruitment rate in order to maintain the work with the new generation. 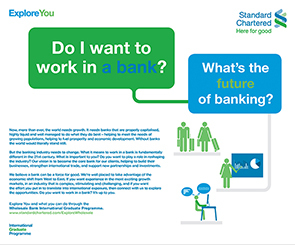 We looked into the problem and discovered that most of the graduates do not know they can apply to banking even if they are not studying finance or banking relating subjects. 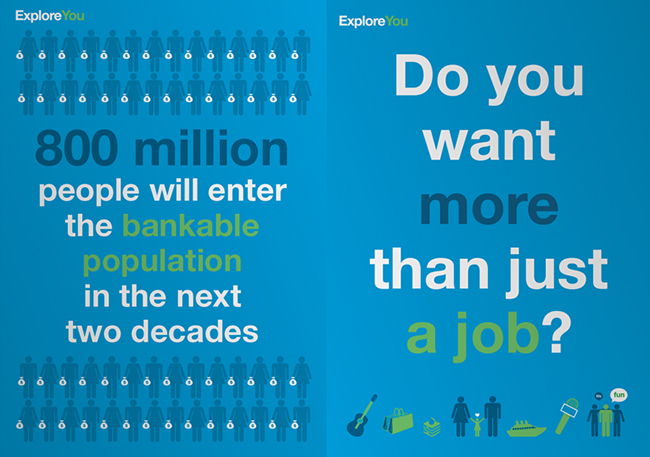 And they never thought of an actual plan to succeed their future dreams. 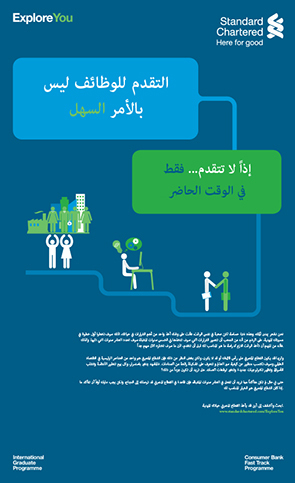 They are vulnerable. 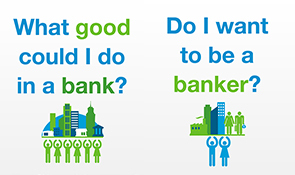 They don't know what they're good at. 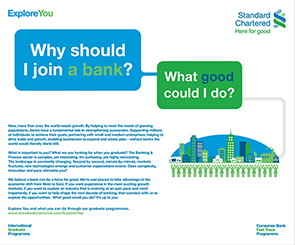 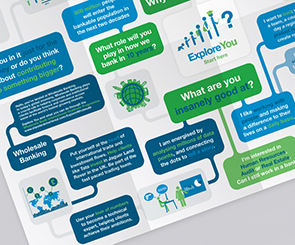 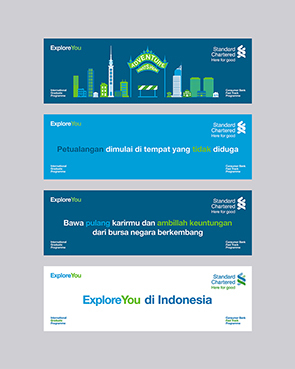 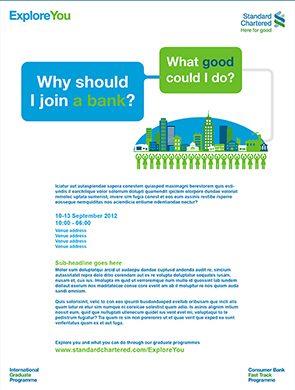 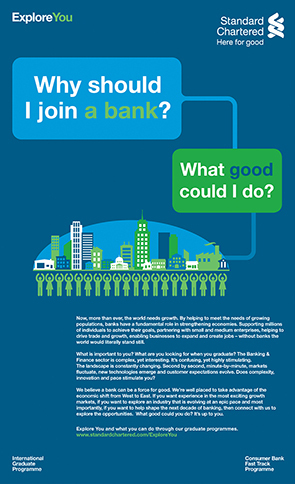 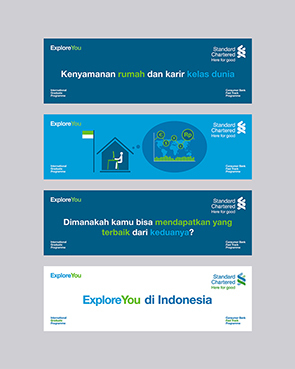 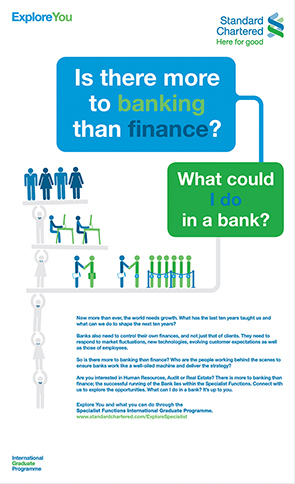 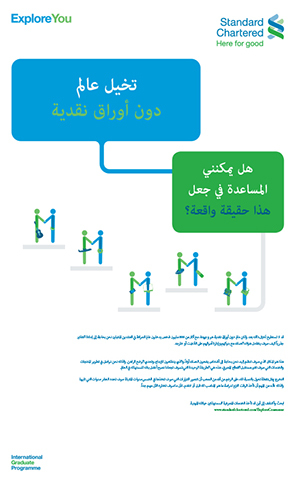 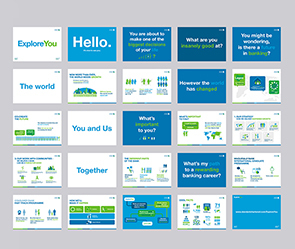 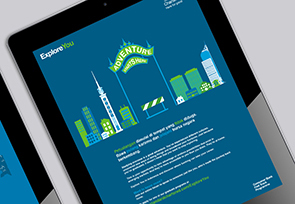 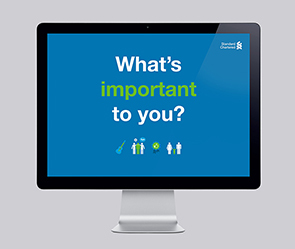 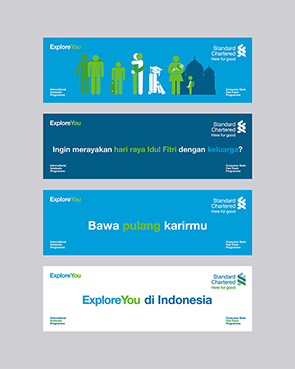 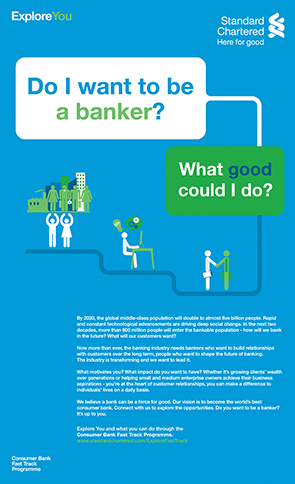 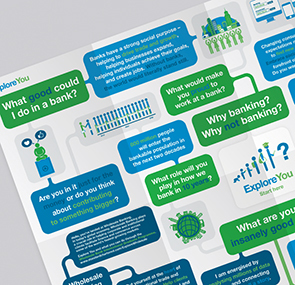 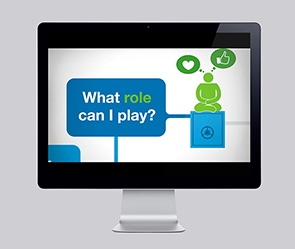 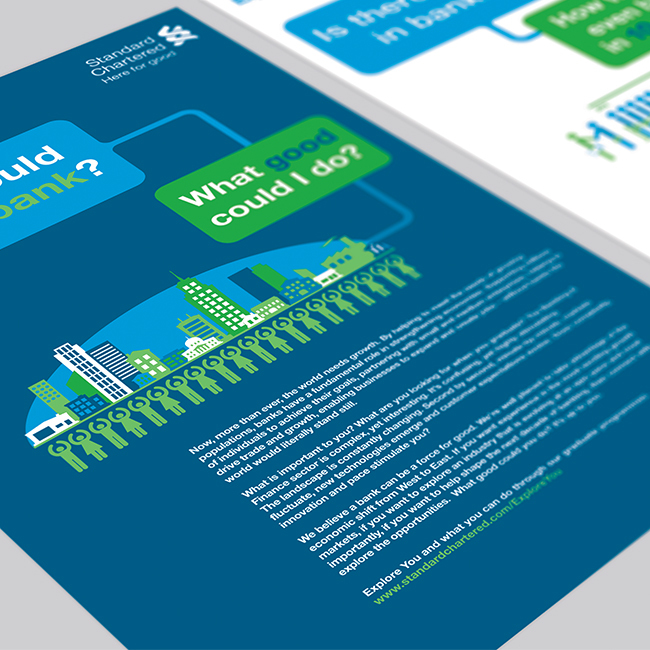 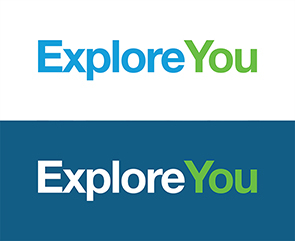 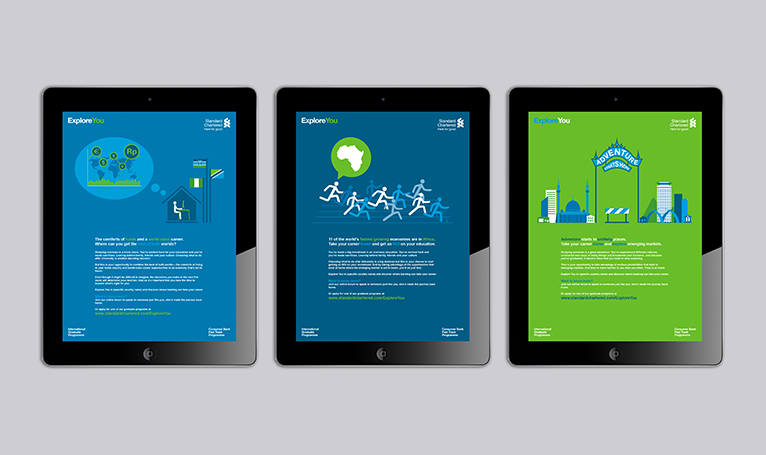 So we developed the ExploreYou campaign to educate the graduates what is the role of banking in the society and how it can benefits you to achieve different dreams by working in Standard Chartered. 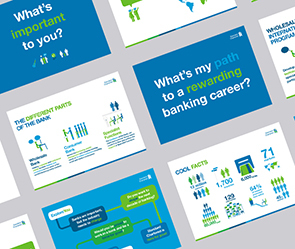 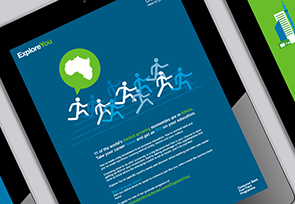 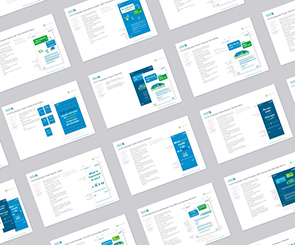 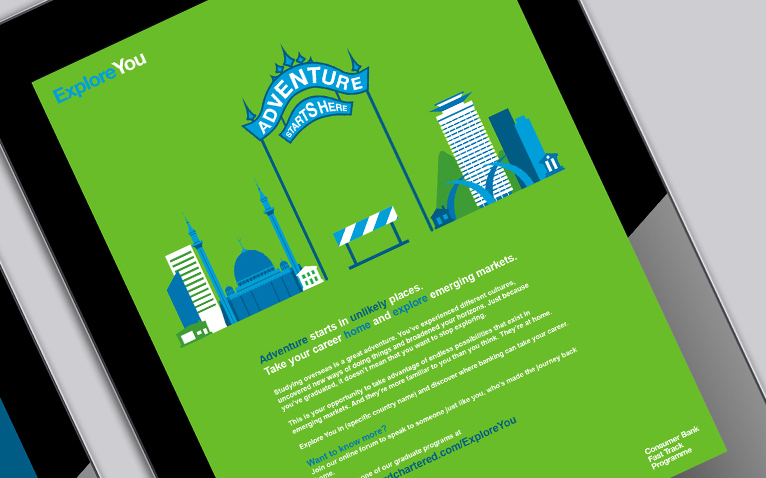 We've created a suite of advertisements and toolkits for all the 35 countries to engage graduate candidates. 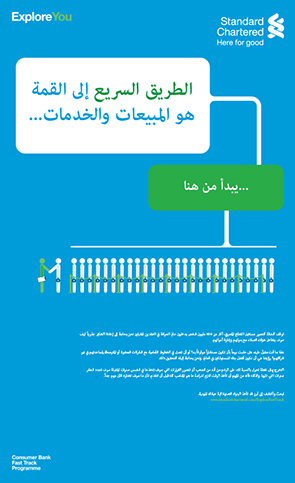 We speak graduates' language. 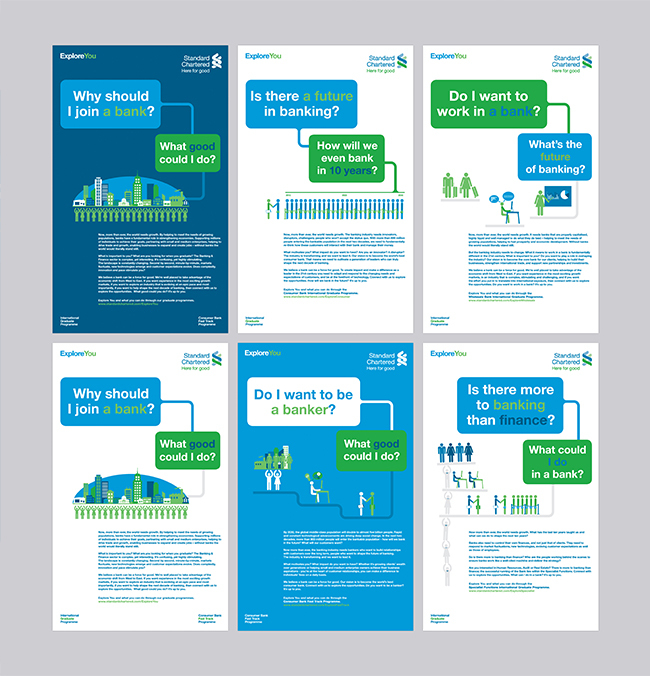 We use no business looking stock images and "about us" A4 brochure. 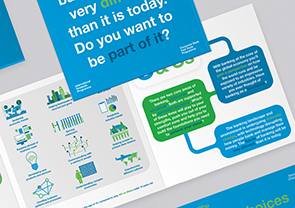 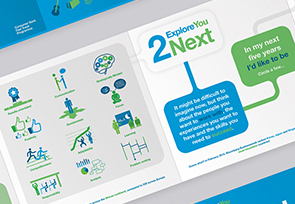 We use clean and simple graphic and infographic presentation to tell the story, to attract their attention. 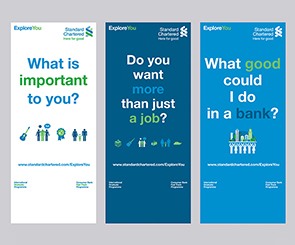 We stopped telling them all about Standard Chartered and started asking all about them. 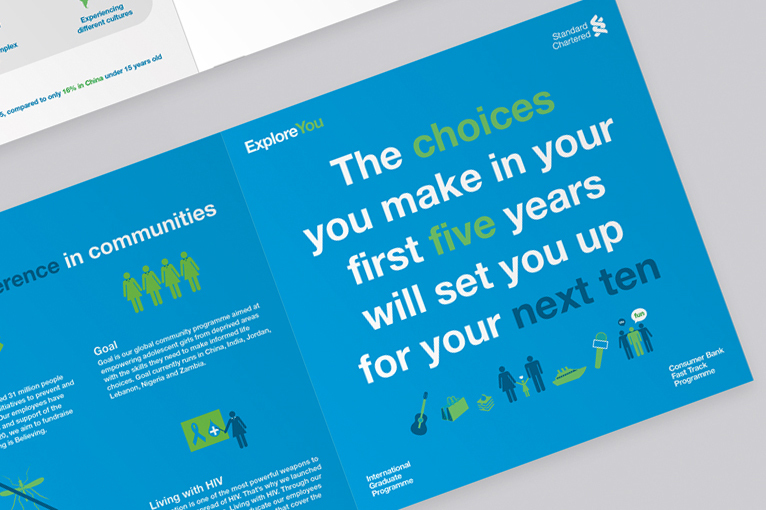 We inspire them to think right now what do they want in 5 years time.